Both anecdotal and empirical evidence suggest that cigarette smuggling is a significant problem. The smuggling and related unintended consequences are born of high excise tax rate differentials between states, among other factors. This study is just one contribution to analyses that have been performed by academics, think tanks, business consultants and government agencies. The Mackinac Center’s research in this field was born from an interest in published news accounts of high excise taxes and reports of cigarette smuggling arrests. These arrests — involving a smuggling cell from North Carolina — remain among the highest profile smuggling busts in the Great Lake State. To estimate of smuggling rates, we fed data such as legal paid sales of cigarettes and adult smoking rates from 47 of the 48 contiguous states into a statistical model of its own creation. The model is a relatively straightforward one. It compares the legal paid sales of cigarettes to smoking rates by state. The difference between the two must be explained somehow and we believe it can be explained by smuggling. Since the Mackinac Center first published its results in 2008 (based on data through 2006) it has had its figures updated five times, including this 2016 update using 2014 data. New York continues to be the top target for smuggled cigarettes — our model suggests 55 percent of the cigarettes consumed there are smuggled in from other jurisdictions. This make intuitive sense as the Empire State has the nation’s highest cigarette tax rate and New York City also imposes its own local excise tax on top of that. In addition, it takes less than six hours to drive from low-tax Virginia to New York City, limiting transportation costs associated with illicit acquisition and distribution. New Hampshire is America’s number one smuggled cigarette exporting state. For every 100 cigarettes consumed there, more than 80 are exported elsewhere. This is not a function of the state having an absolutely low excise tax rate, just a relative one. Surrounding state taxes are so much higher that it is cost effective for many people in neighboring states to casually smuggle their own cigarettes out of New Hampshire. 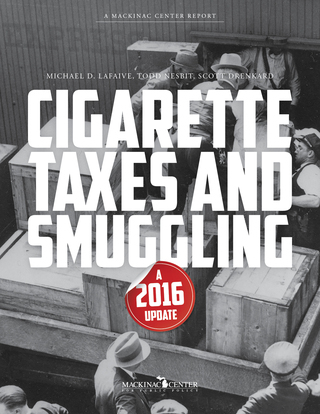 Without reform of excise taxation practices, many states will continue to see major arrests for cigarette smuggling operations and their related unintended consequences. Governments have simply made trafficking in cigarettes too profitable for criminal classes to avoid. One way to thwart the trade is to decrease its profitability by reducing excise taxes or decreasing the large disparities in cigarette tax rates among states. At the least, most states should avoid incentivizing more people to partake in illicit activity that comes with raising marginal cigarette tax rates. Policymakers need to give these unintended consequences of cigarette taxes thought before jumping to raise these tax rates to new levels. But issues of taxation and illegal smuggling are not the only consideration. Lawmakers should also regard the value of the freedom of individual’s to take risks with their own health. As our model suggests, no matter the taxes levied on cigarettes, people are going to continue smoking, even if it requires them to partake in illegal activity. In other words, hiking cigarette taxes may not be the policymaker’s version of a slam dunk — automatically boosting government revenue while simultaneously improving public health. Instead, hiking cigarette taxes can encourage illegal casual smuggling, raise the profit motive for professional criminals to engage in commercial smuggling, create new law enforcement and court costs and introduce new violence on the public as criminals fight over shares of the profits from a growing black market for cigarettes. While it’s impossible to pinpoint exactly what the all the effects of each new tax hike might be, these very real potential side effects need to be considered.